Thanksgiving is an act of giving thanks, a time for grateful acknowledgment of benefits or favors, especially to God. While we often attend our favorite high school or college football game, stuff ourselves with turkey with all the usual trimmings and say a grateful prayer for all the good things that have happened to us in the last year, we might also reflect for a minute on just how this holiday came about, and what part New Jersey and Newark have played in its creation and celebration. If you remember your high school history lessons, you probably credit our New England cousins for starting the whole affair. But that is only part of the story. Granted that the first general Thanksgiving holiday was declared in Plymouth Colony in October 1621, but it was a New Jerseyan who took steps to introduce the holiday to the young nation in the late 18th century. After that first holiday, Thanksgiving was celebrated again in 1679 when an infectious disease and smallpox epidemic was crushed in New England. Another celebration occurred June 11, 1696, when a plot against King William III was discovered in New England. The idea for our present holiday was envisioned by Elias Boudinot, a prominent New Jerseyan who sat in the first U.S. Congress, lived in Elizabeth and practiced law right here in Newark. Boudinot (1740-1821), a local statesman who had been president of the Continental Congress, asked President George Washington to sign a proclamation for 'a day of public thanksgiving.' Unlike the Pilgrims, Boudinot did not design a holiday to thank the Lord for a bountiful harvest. He wanted instead to issue thanks for the creation of the country's Constitution. This seemingly innocent resolution was met with immediate opposition from a South Carolina colleague who wanted none of it and objected to the whole idea on the grounds of the separation of church and state. Already, signs of regionalism were emerging in the newly formed Congress. Indeed, there was some grumbling about a Northeastern holiday being forced upon Southerners. Nevertheless, Washington agreed with Boudinot, and on October 3, 1789, 'bade the nation pray and be seated at the feasting table.' Strangely, Thomas Jefferson didn't agree with the holiday either and called it a 'monarchical practice.' For a good portion of the next century it remained basically a Northeastern holiday. In effect Washington only recommended, not decreed, the holiday, leaving it for governors to support it. Guess who stepped up to issue the first proclamation—New Jersey's Gov. William Livingston, who enthusiastically endorsed the idea with a strongly worded declaration setting aside a day for celebration. Between 1815 and 1861 there were no presidential holiday decrees. New Jersey Gov. Charles S. Olden actually changed the holiday to September 26 in 1861, then moved it to April 30 in 1863. In 1865, President Abraham Lincoln declared that it should be celebrated on the last Thursday of November. New Jersey, for some curious reason, celebrated it the following year on July 4. It took an act of President Theodore Roosevelt to re-establish Thanksgiving on the third Thursday in November, some say to allow additional time for Christmas and holiday shoppers. In 1941 the legal date was finally set on the fourth Thursday in November. Hopefully, here it will remain. Whatever the changes, historian John T. Cunningham noted a few years ago that the nation owes Elias Boudinot of Elizabeth a very special word of thanks 'as the man who believed that the new United States should start its long journey into time with a dedicated day of Thanksgiving.' Thus, it took a New Jersey lawyer from Elizabeth to turn a basically Yankee holiday into one of our warmest and most cherished times of the year. The procession was put together by Bamberger's employee Tony Sarg, and included buccaneers, courtiers, frontiersmen, circus clowns, stilt walkers, a giant, a 100-foot dragon, and all sorts of attendants who strove to keep the balloons and equipment free of low-hanging overhead trolley wires. The 113th Infantry, local police bands, firemen and the Newark Mounted Police Squad, along with fire equipment of all sorts, accompanied the marchers. Upon arriving at the front door of Bamberger's, the dragon was allowed to soar off with the winds, as were the other helium-inflated figures. The endless procession, which assembled at the Carteret Academy grounds shortly before 9 a.m., reached Bamberger's Washington Street entrance at 11 a.m. and was dispersed by 11:45. Three spectators who remember the event are Louis E. Schindel, now of Chatham, Richard Grossklaus of Newark and Syvella Copeland of East Orange. Schindel recalled the holiday because it was the anniversary of his parents' marriage. He thinks it was about 1924 when he was 'dumped into Santa's arms' as his Dad, superintendent of Bamberger's and general manager of the parade, was called away to respond to an urgent in-store matter. 'I had a place of honor and helped Santa review the parade.' 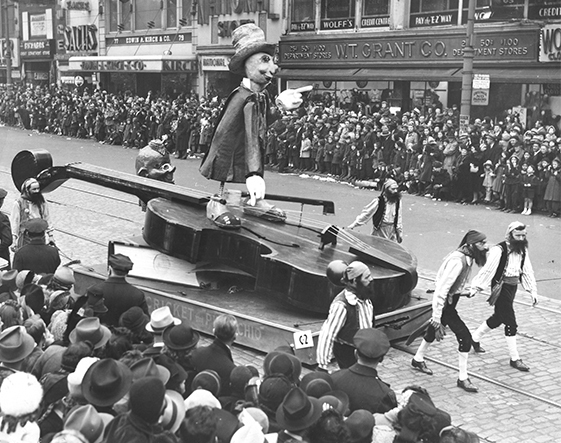 Grossklaus remembered the parade in the late 1940s and all the preparations leading up to the holiday. His uncle, Campbell Kerr, picked him up from his parents' home in Verona and took him to Newark, where all the other suburban kids wanted to go. They caught the train from Montclair and got off at the Roseville station, then walked and rode a bus downtown to see the parade at its terminus at the downtown store. The fact that this was a family-oriented holiday, the excitement of going to Newark to see the state's best parade, and the anticipation of a turkey roasting back home, made the events of the day very special. Every year the smell of baking turkey brings back some mighty nice memories, he said. Copeland, who grew up on Newark's 13th Avenue, remembered watching the parade as a teenager at West Market and Howard streets with her classmates as the floats wound their way through the city. The procession resulted in the eventual enthronement of Santa Claus on top of the marquee of Bamberger's Washington Street entrance. The weather was cold, the crowds large, and the excitement high as throngs milled around exchanging holiday greetings. Not only was this the beginning of the best part of the shopping year at Bam's, it was a time when all the nearby merchants also brought out their best merchandise and prepared for the holiday rush. Today, Bamberger's is gone, as well as the era of the great downtown Newark department store. Unfortunately, Newark's wonderful Thanksgiving Day parade was 'hijacked' by Manhattan's Macy's. Yet I bet many Newarkers and suburbanites over 45 still remember the time when Santa proudly rode down Central Avenue on the way to be installed in a great department store at Christmas rather than just appearing on a television screen from New York City. Those days in Newark were ones many people still cherish. Now, we must go out and create some new ones for tomorrow.